I first tried this roll at a sushi restaurant called Maki Maki, although it can probably be found at most sushi restaurants. Son took me there last year for my birthday, and we have been stopping by every time we are in the area ever since. We almost always get the Philadelphia Roll when we go there, since it’s a very smooth, creamy roll. I believe that the roll gets its name from the cream cheese, as Philadelphia cream cheese is a popular choice. So yummy! Slice the smoked salmon into thin strips, about 1/2 inch wide. Cut cream cheese into thin sticks, about 1 cm wide. 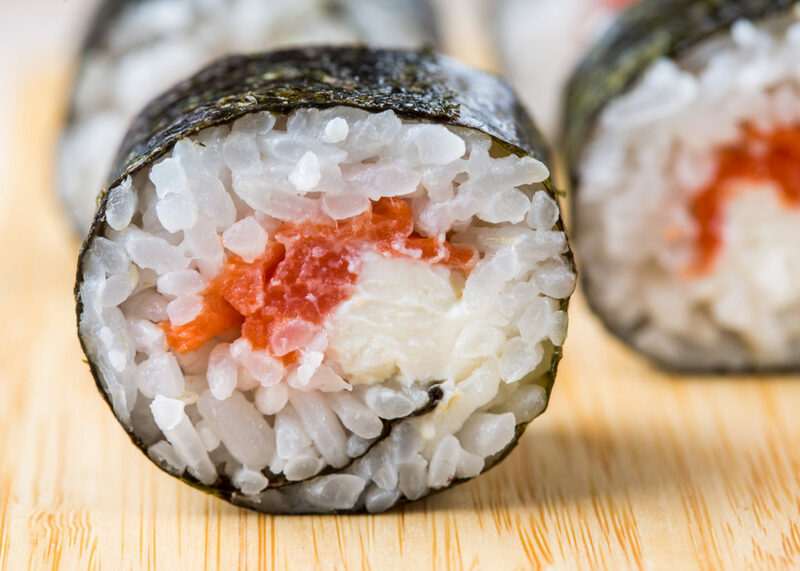 Roll the sushi, using smoked salmon, and cream cheese as your fillings. Serve with shoyu, wasabi, green onion, and ginger if desired. Enjoy! I used to LOVE Philadelphia rolls! I didn’t know it was smoked salmon- thought it was regular raw salmon but yeah. Delicious! Someone once said this should be called a LOX roll… or a NYC roll because of bagels/lox/etc… never thought of it that way until they said so! And I never realized it was cuz the cream cheese was Philadelphia, haha, I’m dumb! Yvo – Yeah, it’s smoked salmon. Yum! Hehe yeah, maybe I’ll try to make a NYC roll… I wonder if it’s any different? Ulysses – Ooh what’s in the Hot Philadelphia? How is it different? I did a little research, and I found that most people say that the roll gets it’s name from the popular brand of cream cheese… but I have no idea what was going through the mind of the creator of the roll, so I could be wrong! I’m pretty sure the name is from the brand. It just seems too obvious not to be true. Shrug. Anyway, the restaurant I work at makes this roll with avocado, and I really prefer it without. It’s popular and delicious. Even for me, and I don’t much like cream cheese. It’s the combo. Who is it out there that thinks up these farfetched yet palatable combinations? Allison aside, of course. Interesting! That’s good to know (now I’ll know why if someone refers to this as a Seattle Roll!) 😀 Thanks! Pingback: Amanda Noelle's Corner of the Web | Happy New Year! Never had a “Philly roll” before moving to the east coast. As a general fan of sushi rolls, it didn’t take long to add this on to my favorites. 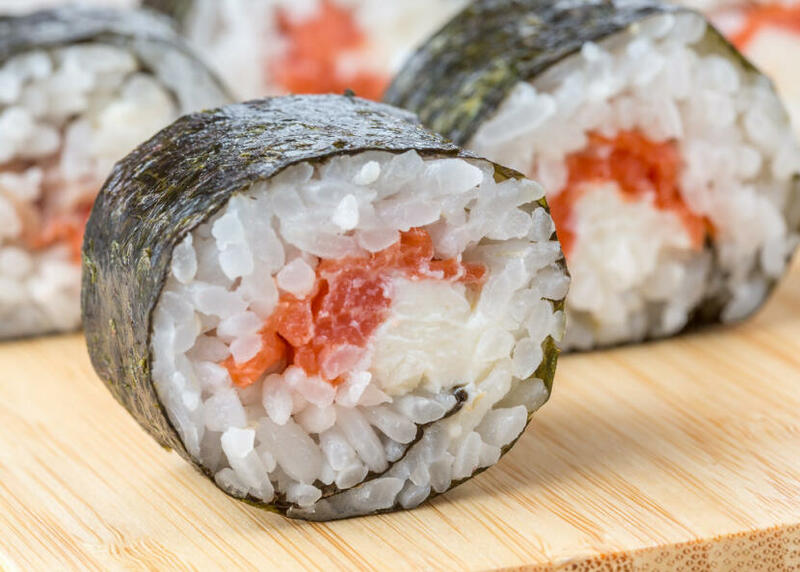 A lot of sushi rolls of east coast cities are salmon roll variations, the Philadelphia take having the cream cheese, so it’s not just the brand, the roll is from Philadelphia too, the brand was just the perfect fit. Generally these rolls are called Philadelphia rolls because of the cream cheese brand, or vary depending on location. For example, one of the restaurants here in NYC refer to it as a “Brooklyn Roll” Not too entirely sure why? And it’s pretty funny since the restaurant is located in the Bronx. Also, the avocado version is more popular here in NY. The other times you’ll see the cucumber used. And sometimes it’s JUST salmon and cream cheese so. OH, word of advise! TRY THIS ROLL WITH SPICY MAYO. It is DELICIOUS together. This is my favorite sushi roll of all the types. Hikari – Ooh, I’ve never tried it with spicy mayo. I’ll have to, because that really does sound delicious. Thanks for the idea! In cincinnati the philadelphia roll has cream cheese, avocado, and imitation crab. it’s my favorite! i’m a complete newbie when it comes to sushi and i wanted to thank you, i just made this philadelphia roll yesterday and it ROCKED!!! anyway, thanx for teaching me how to make sushi!! you’re great!! Philadelphia rolls consist of thinly sliced smoked salmon, cream cheese, and scallions. Usually the are inside-out rolls (seaweed on the inside). There are many variations but anything besides or without these three ingredients is not a true Philly roll. Chili crisp, and an eggnog gingerbread french toast bake for Christmas!